What happens to make it stop at 100 seconds? These experimental devices don't have the cooling necessary to keep them running for very long. 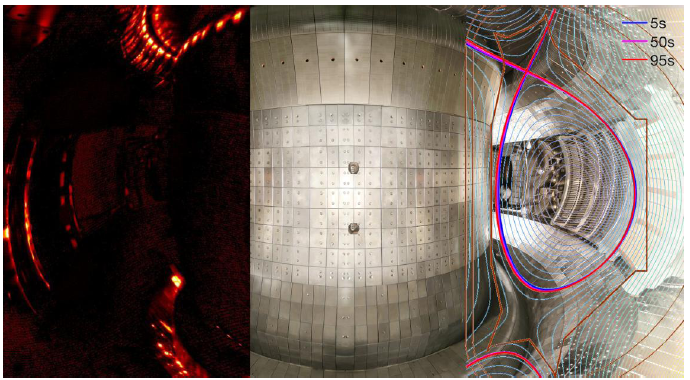 "It is the first tokamak to employ superconducting toroidal and poloidal magnets. It aims for plasma pulses of up to 1000 seconds." Can someone explain to me what steady-state plasma means and whats is this artificial sun? This is the internet. There is enough info in the above article for you to do your own research and educate yourself. That doesn't mean they are able to do it right now. The Wendelstein 7-X too is aiming for plasmas up to 30 minutes, but in its current configuration it can't achieve more than 50 seconds before the RF transmitters and the reactor parts overheat - because they haven't actually built the cooling systems and reactor shielding yet. Doing so would have been a pointless waste of money and time if it hadn't worked as expected. You don't build a prototype up to full production specs only to find out the design is fundamentally flawed and doesn't work. Suppose you're rebuilding a car engine, and want to see if it will even start - you don't need to bother to hook up a water pump and radiator to run it for 10 seconds. You're still ad libbing. Those are the design parameters. Google it. Maybe you can find milestones and planned upgrades. LHC didn't start off at full power either did it? Gullible leftist Westerners are too quick to believe this stuff from China. Like how they are at the vanguard of the fight against mythical global warming while they continue to build dozens of coal power plants. Sheep. Meh, commies always go for the One Big Factory approach. Tokamaks may eventually work but there are more promising avenues. If the Chinese were really smart, they'd be trying small fusion. But it would be disruptive and anarchist. The cadres and commissars wouldn't like it. Those are the design parameters. Google it. Maybe you can find milestones and planned upgrades. The tokamak itself is designed to operate for 1-1000s but not necessarily at high currents. It looks like at 102 seconds they reach the power supply's limits and have to shut down. - this isn't a prototype. It's a test reactor, designed to ultimately operate for 1000 sec per pulse. Gullible leftist Westerners are too quick to believe this stuff from China. This is an international collaboration and has been going on for quite some time. over-unity devices which are large, cumbersome, and can only exist in a regime of centralized power, where the 'free energy' can be leveraged at net zero cost... to control populations..those technologies are real and coming. They can be promoted. any similar thinking of the cracking of the firmament, which involves individuals creating or utilizing 'over-unity', or 'free energy', where someone tinkers and makes it work - all of that is lies. No such individual and individual freedom enhancing or enabling technologies will ever work, and all purveyors of such are freaks, illiterates, charlatans, thieves, fakes, and so on. They need to be ridiculed and their technologies wiped out. Tokamak centralized controllable 'excess energy' -- good. Individual freedom enhancing and democratizing zero fascism/corporatism/despotism 'excess energy' devices -- bad. So get out there and shill, shill, shill, and attack, and make sure no one attempts to be free. You're welcome to cut your own firewood and make tallow candles if you want. What's stopping you? You can even use the trolleys as fusion will make them free.